The attack on federal workers continued in May when President Trump signed multiple executive orders limiting official time, making it easier to fire federal employees, and lengthening probationary periods for new employees. Each of these edicts are designed to weaken unions, federal employee compensation and civil service protections. 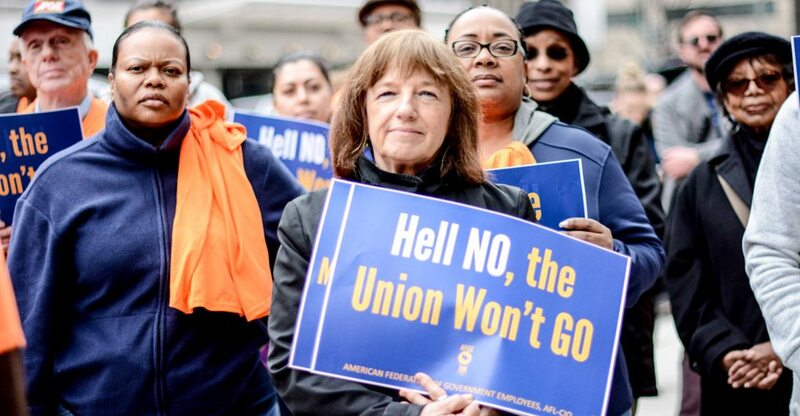 These, along with other moves by the Trump Administration, including imposing a contract on a union against its will, are bound to affect federal employees for the worse. His first directive was to drastically cut “official time,” which he would like to rename as “taxpayer-funded union time.” Official time is the time allowed to union officials to represent all members of a bargaining union, whether they are a union member or not, in matters of interest to the workforce. AFGE filed a lawsuit asking that the Executive Order 13837 — slashing paid union time — be struck down by a federal court. Executive Order 13836, directs federal agencies to renegotiate their union contracts to increase management authority to “reward high performers, hold low-performers accountable, or flexibly respond to operational needs.” It also states that collective bargaining should not take more than a year. Claiming that it takes six months to a year to remove a tenured federal employee for poor performance, and as many as eight months to exhaust any appeals, a White House spokesperson said the EO would “streamline the process.” However, union representatives say it would politicize the hiring and firing of federal employees. Finally, Executive Order 13839 would change the longstanding federal worker job security protections currently in place. Instead, workers would be subject to what amounts to an “at-will” environment. Managers would no longer be required to use “progressive discipline” and will not be held to a consistent standard of how discipline is handled. The EO shortens the timeframe for employees subject to Performance Improvement Plans (PIPs)—which provide employees a chance to improve their job performance following a poor evaluation or reprimand—to 30 days, government-wide. It currently runs between 60 and 120 days and changes the seniority rights provision replacing it with a “manager-evaluated performance ratings system. Again, union representatives believe that this order would allow managers to promote and fire at will, rather than for cause.